I almost appreciate Google helping me comply with this. But, but, but I can't know whether or not I am complying. Today is the day we stop to give thanks. To think of what we have received and who it came from. Then we are supposed to say so - "the giving" - but I don't do very well on the action part. I thank God for my wife, my family, our church and our community of Lake Forest Park, WA. Family: I attended the retirement party for my brother Rick yesterday. He worked for Seattle Pacific University for 18 years. Growth of our economy brings more jobs, higher paying jobs and challenging jobs. We need it badly. This year Hillary Clinton offers more Obama stagnation. The 2008 recession ended in 2009, but we have little growth since. Obama's drop in the unemployment rate is NOT due to more people working but to people giving up on the job search and sitting on the side line. Donald Trump is far from perfect, but he is far, far better than Mrs. Clinton on jobs and the economy. Does Bernie Sanders want GE to remove 1,500 jobs from Vermont? Bernie Sanders of Vermont complains constantly about immoral corpoerations. Generally without any examples. But recently he cited giant GE. Does Sanders want GE to close two plants and remove its 1,500 employees from Vermont? And stop buying $40 million of parts and services per year in Vermont? And Immelt defends GE's global business. Would Vermont be better if GE took those jobs to another state? Via Powerline Blog. Swedes are leaving their wonderful, perfect country. Don’t we wish the US could be like Sweden? Where are the Swedes choosing to go? The United States is the top destination!! … emigration reaches record levels. Last year, 51,237 Swedes left the country. It is more than the peak reached in the late 1800s when there was an agriculture crisis in Sweden. And there might be “unregistered residents” also departing, making the number larger. Yale University is closing its climate institute - Yale Climate and Energy Institute. It only opened in 2009. Looks like the priorities of the elite changed rather quickly. Everyone told us the Paris climate summit in December, 2015 was going to solve everything. If it did we can stop spending money on “settled science." This should be just the beginning. Yale Students respond. Maybe alumni were not donating to it. Congress got three things right this year. 1. End oil export ban. It was a good-faith effort to reduce dependency on imports after the 1973-74 Arab oil em cargo. But market forces have overwhelmed this simplistic approach. The goal has been attained by increased US production(!) due to fracking. Furthermore US refineries are not set up to handle the characteristics of US crude. It can be processed in many places overseas. Let the marketplace decide where. 2. Make permanent removing marriage penalty from EITC - Earned Income Tax Credit. An income subsidy for families with children, it penalized families where both parents were working. A correction was put in place in 2009, but was temporary. Broadening the “serve for 20 years, so you can retire” rule. Under the existing policy only those who completed 20 years got anything toward retirement. Now all those serving will be able to establish 401(k)-type accounts with employer matching. Charles Lane puts his best left slant on this meager good news at Washington Post. Did they get anyting else right? Can't think of anything. Making Paul Ryan Speaker was worse than a disappointment. 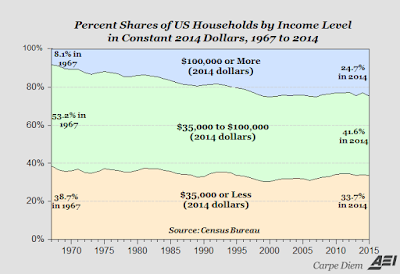 The middle-income group in the US has gotten smaller. We have all heard this. 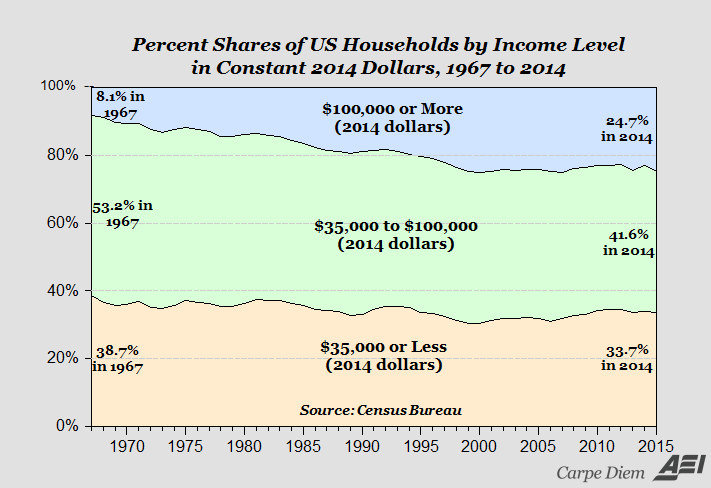 The assumption is always that the families no longer in the middle dropped to lower-income. Wrong. They moved up. While the middle group got smaller the top group got larger; even the lower group got smaller. Data for 1967 to 2014. Graphics and data from Prof Mark Perry’s Carpe Diem blog at AEI - American Enterprise Institute. Click to enlarge.